Inspired by the end-of-the-year spate of what’s coming in the next 20 years articles in tech magazines and such, I started musing on the future of knitting. Just think how far our gentle art has come in the last 20 years. 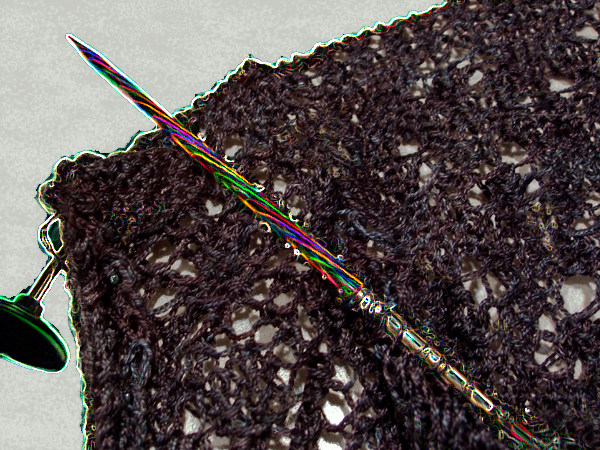 When I first started knitting (OK, that was way more than 20 years ago), my choices in knitting needles were metal straights, metal circulars with stiff rubber cables and metal DPNs. My choices of yarn (I did live in a small town) were scratchy, stiff wool or Red Heart. Now I can choose from needles (all types) made of everything from lovely, exotic (but sustainable) hardwoods to bamboo to chrome-plated nickel to brass. Cables are soft and have no memory. Yarn… the softest wool imaginable, silk, bamboo, angora, mohair, yak, camel, cotton, kelp, chitin… who’da thunk it way back when? I stop by Tangle on a yarn mission. Alice and Kaye, I say, I’m really interested in trying that new yarn made from that stuff the Japanese are mining on the moon. Do you have that yet? Oh, the Rowan Moon Mist, Kaye says. That stuff is so yummy! Alice says, We don’t have it yet. But I can order it for you. What color are you looking for? Alice pops up a color chart on the display that covers the wall above the counter. The display has been calibrated to be absolutely true to color. I pick out a soft green, confident that there will be no color surprises when it arrives. I touch the green sample and say, I’d like this colorway. Alice selects the pre-wound option and touches the order button and I pass over my credit card. I’ll pick it up. I have to go back to the back anyway. Kaye offers. I sit down to see what my fellow knit-buds are working on. C, as always, is whipping out a gorgeous fair-isle sweater. It’s for my first great grandchild she explains. Curious George is working on her Advent calendar. My kids never noticed that I used the same mitten over and over. But I think the grandkids might. M is trying to decide what to knit for her daughter. B is crafting a few of her cute little fruit and veggie hats. Nurse Knitter and E are both working on socks. I’m going to really get these done! E exclaims. In other words, not much has changed here over the intervening years. Kaye returns from fetching my order from the back room, where Rowan has delivered it to the transporter module, already wound in center-pull balls as Alice specified. I pull my Knit Picks PrimoTech Symphony needle set from my knitting bag. The green Moon Mist is slated for a scarf for #1 Son. Being vegetarian, he really appreciates the new non-organic fibers. I dial my intended gauge into the PrimoTech calculator, and it selects needle tips for me. As I knit, sensors in the Symphony needles will constantly check my gauge and subtly shift in size to make sure my gauge stays consistent with the requirements. The more I knit with my set, the more consistent it will keep my knitting as it learns my style. And of course the tiny little jet engines in the cable joins really keep those needles flying! All right… maybe that last was a little over the top. What do you see coming in the next 20 years?